Microsoft Security Essentials provides real-time protection for your home PC that guards against viruses, spyware, and other malicious software. It is a free download from Microsoft that is simple to install, easy to use, and always kept up to date so you can be assured your PC is protected by the latest technology. It’s easy to tell if your PC is secure — when you’re green, you’re good. It’s that simple. Lol all the windows 8 machines have this built in now and that Still come into the shop every day with tonnes of viruses on them. The people who hack windows are so far ahead of microsoft that it makes them look like a joke. MS should consider making a new OS based on unix/linux to get their security problems under control once and for all. Apple is a group of complete ret&rds and yet they were smart enough to figure this out over a decade ago. Google decided to build a new OS from scratch and guess what kernel they used, oh ya Linux. Wake the hell up Microsoft you morons. Please note this application does NOT run under Windows XP. Maybe I'm losing my memory these days. But I thought I read earlier this year they were discontinuing this. Poor detection of malware/viruses/trojans ! May be good at guarding the PC,(while slowing it down), but not so good at removing infections, especially the rootkits involved. If you're going to slow your PC down with realtime security software, get something that can also remove what it is guarding against. This would be great if I still used windows... I don't. Know windows, no security. Have tried this I don't know how many times. Same result: VERY heavy on the PC with its background service running. Besides, realtime A/V software is really only for the internet clueless. I've learned to live without traditional system realtime A/V(spyware and malware) software protection and am doing just fine thank you, and the PC rewards me in return with the utmost speed. BTW, this software keeps dragging down your system even when you turn off its realtime protection because of its constantly running background service. This download description is not properly labelled. This is only a definition update for MSE, not a new version of MSE itself (latest is currently 4.1, so 1.x would be quite a step backwards...). Rating is for the scanner itself still, which is a very decent product. There may be better ones out there, but it does the job for those who are happy with an easy-to-use AV that does not require much attention. 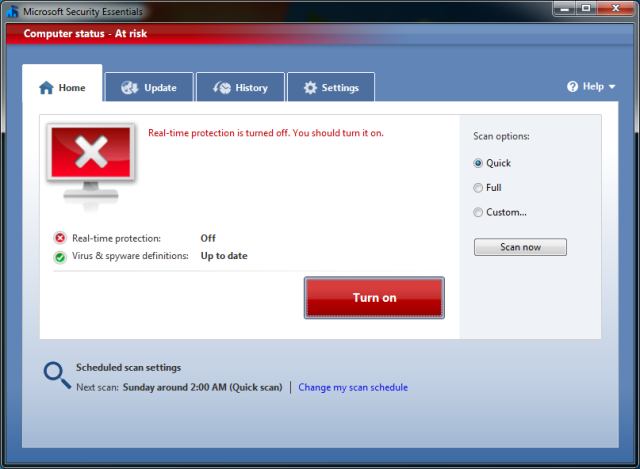 Microsoft obviously bought a product that was doing virus protection right, then branded it. The problem is that this app is very system heavy and memory intensive. I recommend clamwin + clam sentinel. Light, free, real time open source virus protection. Cool! but try ca anti virus, for me its the best, real time scanner is very light, unlike other anti-virus makes your PC stuck at 5-10secs. you can download it here>> ca-anti-virus dot weebly dot com. This is the old RAV antivirus, they change only the name , RAV came from Romanian Antivirus and was the best antivirus on that time, however on this days almost everyone use AVG antivirus , it is the first listed on http://www.free-antivirus.co/ and on CNET network.